First we recognize “Skanska USA Civil West’s Rocky Mountain District” located in Cortez, Colorado. This division of Skanska International is a large construction company specializing in highway construction projects throughout the southwestern United States. Beginning in 1998, after the restoration of Galloping Goose No. 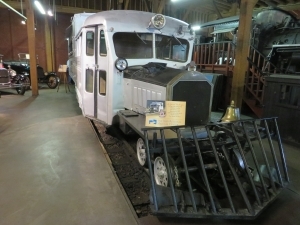 5, there was a need to haul it from Dolores, Colorado to where it could operate on the Durango & Silverton Narrow Gauge Railroad and the Cumbres & Toltec Scenic Railroad, and even twice to the Colorado Railroad Museum in Golden. For the first few years transportation was provided by Neilson Construction Company in Dolores. Several years ago, Neilson was bought out by Skanska and they continued this valuable “community outreach” project. The specialized transportation is provided free of charge to the Galloping Goose Historical Society. Without this support Galloping Goose No. 5 would either not operate at all away from Dolores or on a very limited basis. Skanska provides the expert drivers and specialized trucks and equipment worth thousands of dollars per trip. In addition to transporting the Goose, Skanska has, from time-to-time, provided shop facilities and expert mechanical assistance. To Skanska and its employees we say, Thank You!! The “San Juan Regional Medical Center” is located in Farmington, New Mexico. For the past two years the Galloping Goose Historical Society has received a sponsorship donation from that organization in the amount of $6.000.00 to help offset costs for operating at True West Railfest on the Durango & Silverton Railroad in August. These donations have proven to be a real blessing for the GGHS in our ability to successfully operate at that event!